We provide comprehensive laser treatments for children and adults with Port wine Stains. For children, we begin treatment early in infancy. Treatments are usually performed in the office setting with either no anesthesia, topical anesthesia, or local anesthesia. For those patients who require intravenous sedation or general anesthesia, comparable technology is available for use by our physicians at the New York Eye & Ear Infirmary. Port wine stains are treated with the Vbeam (pulsed dye laser with dynamic cooling), Excel V (KTP and Nd:YAG), Gentlelase ( Alexandrite) and Fraxel Re:Pair (Co2) lasers. Multiple treatments are generally required to obtain significant lightening or clearing. Our technology is the most current and up-to-date laser available. Below, you will see photos before and after treatment. The treated area may turn dark purple -black immediately following your treatment. This discoloration will become somewhat darker over the next several hours and it will remain dark for seven to fourteen days. Surrounding this treated area, you may experience some redness and itching which should resolve within several days. It is possible that you may experience several blisters, scaling or crusting following the procedure. If the treated area is near the upper cheek or eye, you should anticipate some swelling. If this occurs, sleep with your head elevated and apply ice packs. May I wear make-up following the procedure? Make-up may be worn if there is no blistering or crusting following the procedure. Particular care must be taken to avoid irritation of the skin while removing the make-up. You should avoid abrasive or irritating make-up removers. May I be exposed to the sun following the procedure? 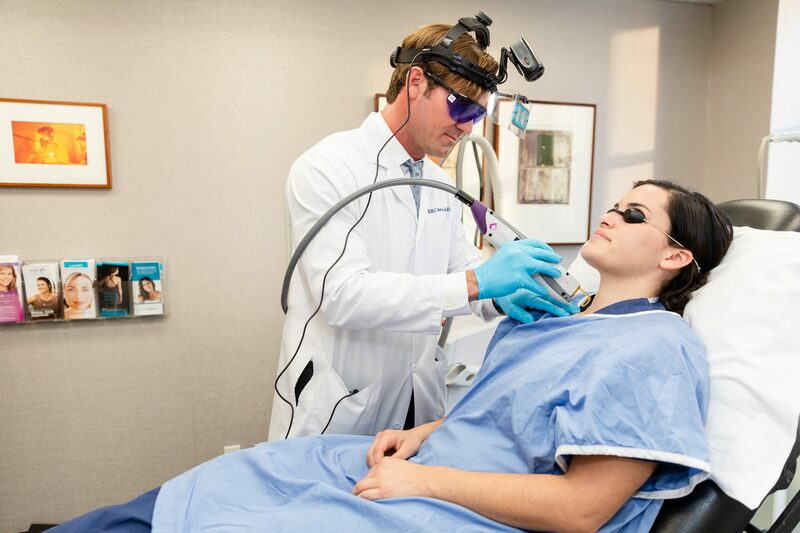 Direct exposure of sunlight should be avoided following pulsed dye laser therapy. If there is no crusting or blistering, a sunscreen of SPF-15 or higher should be applied to the treated area for two months following the treatment to avoid sun damage. When do I return to have my treated area evaluated? You should be checked within four to six weeks to evaluate the effectiveness of the laser treatment.